Guillermo received the Hispanic Chamber of Commerce of Metropolitan St. Louis’ Lifetime Achievement Award. 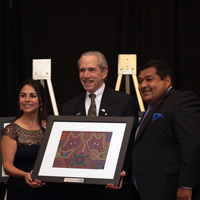 Guillermo Rodríguez, director of International Projects and Study Abroad, was presented with the Hispanic Chamber of Commerce of Metropolitan St. Louis’ Lifetime Achievement Award on April 29, 2016. The award recognizes individuals who have significantly contributed to the development and advancement of the Hispanic community in the St. Louis Metropolitan Area and have, throughout the years, provided continuous and meritorious service, support, and leadership to the Hispanic community for the benefit of the community at large. Rodríguez served the Hispanic Chamber as its chairman of the board for more than seven years from October 1997 to February 2005. He was instrumental in professionalizing the organization during his tenure, an effort that started when he joined the chamber on November 1996. He provided invaluable leadership during those years of transition to a sustainable entity. A native of Mayagüez, Puerto Rico, he moved to the St. Louis region in 1994 and has been at Webster University since 1998. 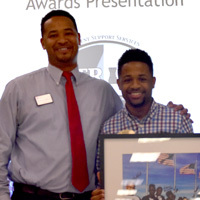 Corey Hawkins, coordinator, minority students, Multicultural Center & International Student Affairs (MCISA), and Erin Bullerdieck, Transitions Coordinator in the Academic Resource Center, received awards from St. Louis Community College-Meramec on April 27 for their partnership with the community college's TRIO program. Bullerdieck began this partnership in 2013 to provide tailored campus visits for students who would likely be admitted to Webster as transfer students through the Transitions program. Stephen Anderson, who is a TRIO Advisor at STLCC-Meramec, has also hosted first-generation workshops and closing events for the summer TAP program for the past three years. In his new role in the MCISA, Hawkins joined together with Transitions and TRIO last fall to coordinate a bus trip to Washington D.C. for the "Justice or Else" march. These and ongoing collaborative efforts will continue to strengthen the pipeline from high school to college ready. 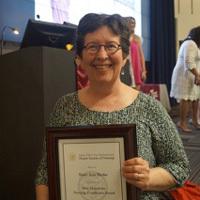 Mary Ann Drake, professor, Nursing program, was awarded the Mae J. Hamilton Nursing Excellence Award from the Delta Lambda Chapter Sigma Theta Tau International at Saint Louis University last week. The award recognizes exceptional contribution to the education of nursing students. Nominations for the award are made by active members of the chapter. Drake joined the faculty at Saint Louis University in 1983 in Community Health Nursing and has long been recognized for "wonderful clinical skills as well as an outstanding role model for the students," one nominator said. She is a “'true teacher” who made learning meaningful and enjoyable and [is] admired by all of her students." She joined the Webster University faculty in 1998 and has been dedicated to educating practicing nurses in the RN-BSN and MSN program. where she has taught students in St. Louis, Kansas City, online, SSM and BJC Healthcare, and abroad in Thailand. Over her years in academia her contributions to education and scholarship have been in community/population health, family health, and public policy.